The Hubble Space Telescope's Advanced Camera for Surveys was used to obtain images of NGC 1427A in visible (green), red, and infrared filters in January 2003. These images were then combined by the Hubble Heritage team to create the color rendition shown here. Astronomers are using the data to investigate the star-formation patterns throughout the object, to verify a prediction that there should be a relation between the ages of stars and their positions within the galaxy. 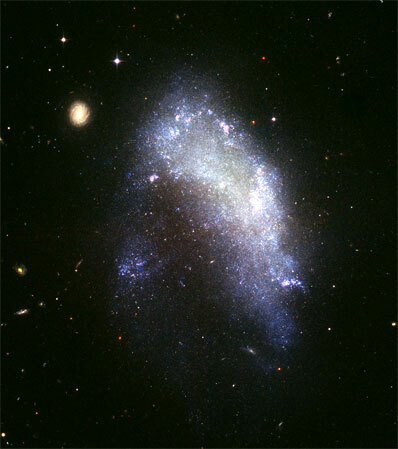 This will help them understand how the gravitational influence of the cluster has affected the internal workings of this galaxy, and how this galaxy has responded to passing through the cluster environment.